Richard A. Chapman/Sun-Times Chicago's parking meters are likely to bring in billions of dollars for private investors over the next seven decades. Four and a half years after Chicago sold control of the city streets to a consortium of investors, Mayor Rahm Emanuel and the City Council are taking steps that would make sure the city is stuck with the deal for the next seven decades. That's not what they're saying openly, of course. The mayor continues to stress that he reviles the deal, but there's nothing he can do to overturn it. The city doesn't have the ability to fight the deal in court, he says, and it doesn't have the money to buy the parking system back. 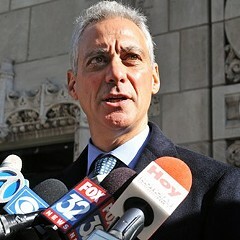 "The parking meter deal is particularly wrong," Emanuel declared recently. "That said, we are stuck with the contract." Or, as city corporation counsel Stephen Patton noted in a letter to aldermen: "The only ground anyone has identified for [overturning the deal] has been rejected as a matter of law in a thoughtful and well-reasoned decision that relies on settled law." There's only one problem with these assertions—they're not true. 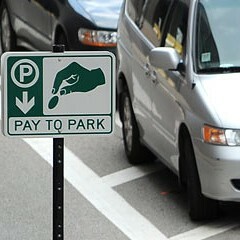 As a result, you, the public, will help enrich private investors when you feed money into the meters for 71 more years. While Mayor Emanuel was saying one thing to the press corps, he had city attorneys making an entirely different argument in court. The issue goes back to the 2008 meter privatization agreement rubber-stamped by the City Council at the urging of former mayor Richard M. Daley. It turned over about 36,000 parking meters for 75 years to Chicago Parking Meters LLC, a consortium of investors led by Morgan Stanley, an investment bank; Allianz, a German financial firm; and the government of Abu Dhabi. In exchange, CPM paid the city almost $1.2 billion, which Mayor Daley said he would tuck away, using the interest to replace the $20 million the city collected annually from the meters. Instead, the city ran through nearly $1 billion of the payout within two years of adopting the deal. As the reality of the deal sunk in, the public was outraged. CPM doubled the meter rates, then doubled them again, to $2 an hour in most parts of the city, and as much as $6.50 an hour downtown. Under terms of the deal, the company also billed the city for millions of dollars in "true-up payments" to make up for taking the meters out of use for things like road construction, street festivals, free disabled parking, and the NATO summit. In 2009 attorney Clint Krislov filed a suit on behalf of the IVI-IPO, a public-interest group, challenging the constitutionality of the deal. Krislov argued that by granting CPM so much financial leverage over the use and placement of meters, it illegally gave away the city's power to set traffic and safety regulations. He asked that the deal be halted or reworked. Mayor Daley fought the case from the outset. 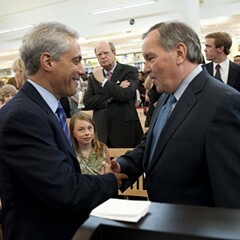 But in 2011, when Emanuel took office, Krislov had faint hope that the new mayor might be an ally. After all, as a candidate Emanuel had denounced the parking meter deal—as did most of the aldermen who voted for it. And just before his inauguration, Emanuel promised clear action. 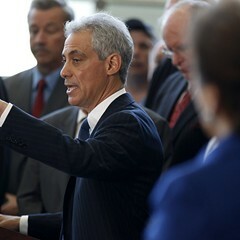 "Know that I have people on the transition—and more than a person—working on this," Emanuel said. "I have some ideas and we're exploring them." But while Emanuel was saying one thing to the press corps, he had city attorneys making an entirely different argument as they fought Krislov's lawsuit in court. The meter deal benefited the city, the administration claimed, by providing an infusion of cash and new meter pay boxes. "Although the Concessionaire may also receive certain benefits as a result of the Agreement, this has no bearing on the fact that the City (and thus the public) will also receive the benefits noted," city attorneys argued in a March 2012 court filing. "Every contract with a private party has some terms that benefit the private party—otherwise, there would be no incentive for the private party to enter into the agreement." The argument they made in favor of the deal was so forceful it might as well have been written by CPM's lawyers themselves. As a matter of fact, CPM's position was almost exactly the same: "The Agreement has materially improved public use and enjoyment of the System." The parking meter company was represented by lawyers from Winston & Strawn, a well-connected firm whose partners include former Governor James Thompson and former U.S. attorney Dan Webb. Two of the three attorneys who worked to fend off the parking meter lawsuit were contributors to Emanuel's mayoral campaign. And so the city effectively teamed up with Winston & Strawn to undermine Krislov's lawsuit. By arguing that there are good reasons the deal should stay in place, Mayor Emanuel gave up the city's leverage with the parking meter company. It was a point that Judge Richard J. Billik Jr. cited when he ruled in favor of CPM's motion to dismiss the case in November. Billik ruled that the true-up payments may be a boon for Chicago Parking Meters and the deal may be bad for the city, but it's not unconstitutional, "particularly in view of the position being advanced by the city itself." The plaintiffs have since appealed. Two months after Billik's ruling, Winston & Strawn held a fund-raising reception for Emanuel at which attorneys from the firm donated $22,500 to his campaign fund, according to state records. That's on top of the $67,000 Winston & Strawn firm contributed to his mayoral bid two years earlier. 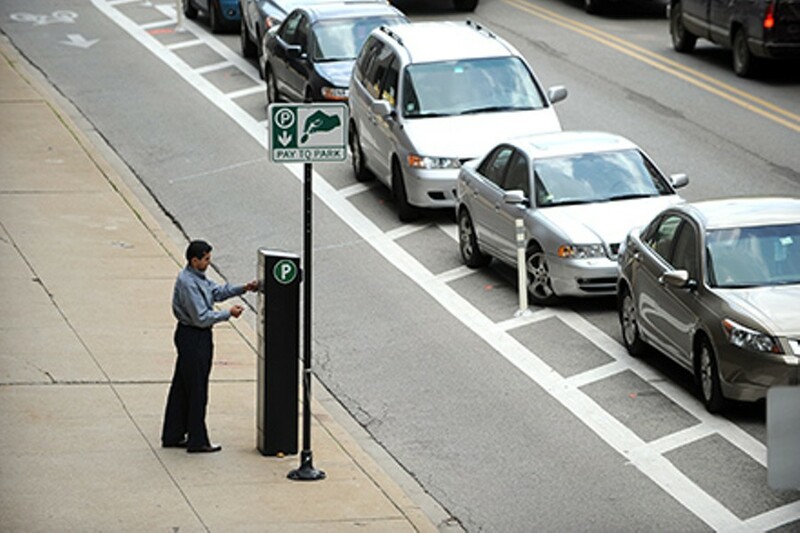 The current meter debate began when Emanuel announced he wanted to amend the deal so that parking would be free on Sundays in most neighborhoods in exchange for extending meter hours from 9 to 10 PM in most of the city. CPM will also settle some true-up claims for less than they'd originally demanded. 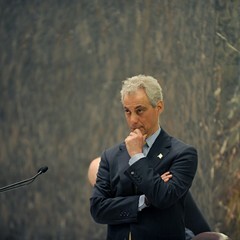 City officials said the company decided it would rather agree to new terms than fight with Emanuel. "One of the reasons, I believe, is the impact of continuing litigation, and facing the steel will of the mayor," Lois Scott, the city's chief financial officer, told aldermen last week. Yet the mayor's steel will wasn't enough to get CPM or its attorneys to show up when aldermen requested they testify. "CPM has legitimate concerns regarding the impact of any testimony on pending litigation with the City of Chicago," wrote a company attorney. "These concerns will remain regardless of the date of the hearing." And the meter deal will almost certainly continue to siphon off the public's money for years to come. Given Judge Billik's ruling, once the City Council ratifies the core of the meter deal again, it will be even more difficult to challenge down the road. As Krislov says, "They're locking in a terrible deal that Chicagoans are going to have to cope with for generations."